Freedom of expression, like most freedom froms, can get extremely messy. We hope people will use their freedom responsibly, but that is not always the case. To say things such as, “I would never participate with those people” is a closed-minded, ignorant thing to do. It is an attempt to stay in a safe space. To prevent being offended. If one does not want to participate, simply do not participate. Stay where the law protects one. There is no use in virtue signaling when doing so, simply move along. How is the weather there in Neverland? Asking you why you think something matters evokes disdain in you? Now I see why you hate guns. It’s not them you are afraid of, it’s you. Its not Neverland several people have defending the concept of white genocide via birthrate in this thread go read it for yourself. That’s not what Nemisis and I were talking about. Read the thread before butting in. Funny how libs keep accusing some of us as racist and bigots. When someone post a picture of pretty gal that’s different race us, we go wow…she cute. Or when someone guns down a bunch of people having different faith from us, we say they have right to defend themselves. Then Chuck Schumer is wrong. You basically said people here were blaming the victims in this thread and somewhere in there bigots and racists came into play. I’m asking you to back up your claim. Dude take a breath - you keep replying to me so obviously it bothers you. Stop replying and you will hear nothing more on this topic that obviously bothers you so much. Yeah, it bothers me to be called a racist and a bigot. Why are you taking this so personally? Please show me where I called you anything. Because you said it personally. The mainstream media doesn’t help when they post articles back to back like this. What is the average nutter to think? 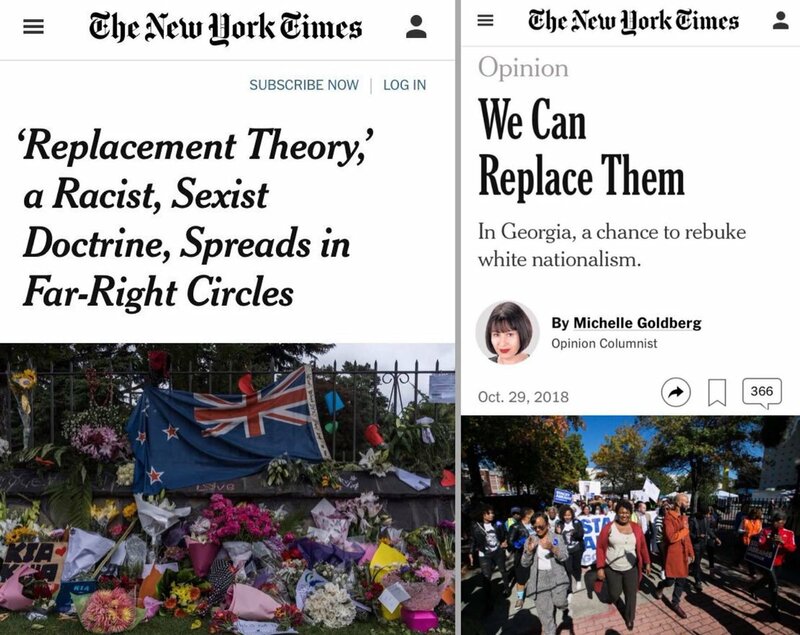 clickbait aside “Replacement theory” is just a nicer name for “White genocide” which is racist. Sad to see a once great country surrender it’s manhood to a PM in a Hijab. Not sure how you are quoting a post that was flagged and removed by the mods. Read the entire thread and you will know the answer to all your questions. New rule folks, if you said something that was deleted is as if you never said it. Who said that? Are you creating new rules? No, but apparent you did. I believe this was a first in the Forum … someone denying having said something just because a Mod deleted it. Gotta admit though, that was a good try. I have not denied anything. I stand by my post even though it was deleted by the mods. Just because a mod deletes my post doesnt mean that somehow I magically stop believing in what I posted. You want to call people racists and bigots? Tell me who I called a racist and bigot? You denied calling members of this Forum “racists and bigots.” But it was shown that you did. Now you seem to be denying that you denied it. Gosh this certainly has got under your skin. I never denied anything and you know full well if i accused individuals of being a racist i would eat a ban or time out so good try in trying to goad me into doing that. Posters in this thread made comments that I have a personal opinion on. I exprssed that opinion and someone or more than someone flagged it and it got deleted. You didn’t deny it but you are denying it on the premise that if you’d done it you’d be banned. Why do you think your post was deleted. Because it was a broad brush accusation of racism by people participating in this thread. You can’t spin this BS fast enough to cover up for yourself. It’s simply a fact, it’s nothing but a gesture because doing so will not prevent a single future crime. The democratic party is going whole hog in attempting to replace White Middle Class Males with Latino’s and Hispanics. That’s not a racist theory it’s simply a fact. You can continue to post and comment and it does not change the fact that I have repeatedly said thar just because my post was deleted doesnt mean I have stopped believing it or somehow it changes what I read. Of course I am not going to repost a deleted post because then I will be banned or eat a timeout and i enjoy posting here.